In this triptych [see EA1983.36], two merchants compete for the love of the geisha Sankatsu. 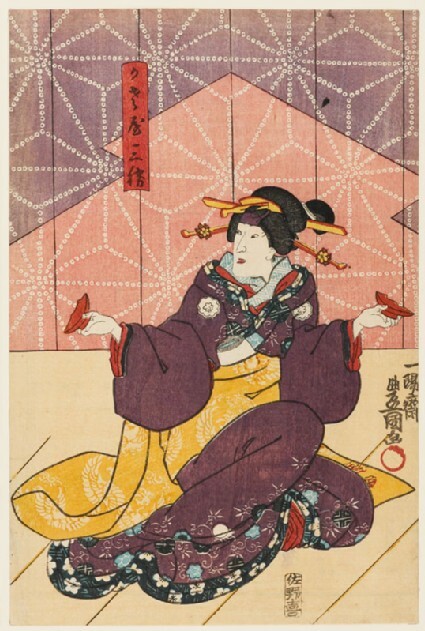 Sankatsu holds the two halves of a red sake cup in her hands, demonstrating her divided loyalties towards the two men. Prints were produced by a team of craftsmen employed by a publisher. The publisher commissioned an artist to produce an image, which was then carved onto wooden blocks by an engraver and finally inked and printed up by the printer. At first prints were restricted to black outlines, which were often hand-coloured. By the mid-1700s, multiple blocks were being used to print several different colours onto a single sheet of paper.